In the "shameless plug for my own tribe" category (though it also fits the "classes you should seriously consider attending because they are awesome" category), here's some hot news from Teejei of Awalim! In addition to her Monday night Tribal technique classes at 7:00, Teejei will be teaching a new choreography class at Dance 101 on Tuesdays at 8:00, starting July 5. This class will feature an ATS-inspired choreography that includes lots of basic ATS moves and technique, plus a touch of Teejei's unique fusion style. Dance 101 is a beautiful all-adult studio where students are surrounded by dance and music of all styles. I love going to classes there and really feeling like a part of the larger world of dance! They often run class card specials that make the cost of a class around $11, which is a great deal. Bookmark Teejei's web site to learn more and keep up with all of her classes! 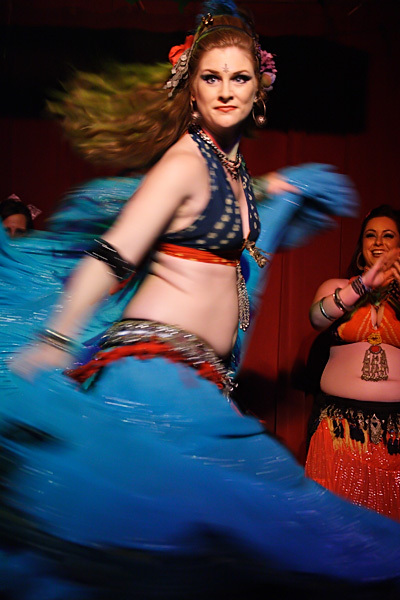 Yes, it's another weekend with lots of belly dance activities to choose from here in Atlanta! 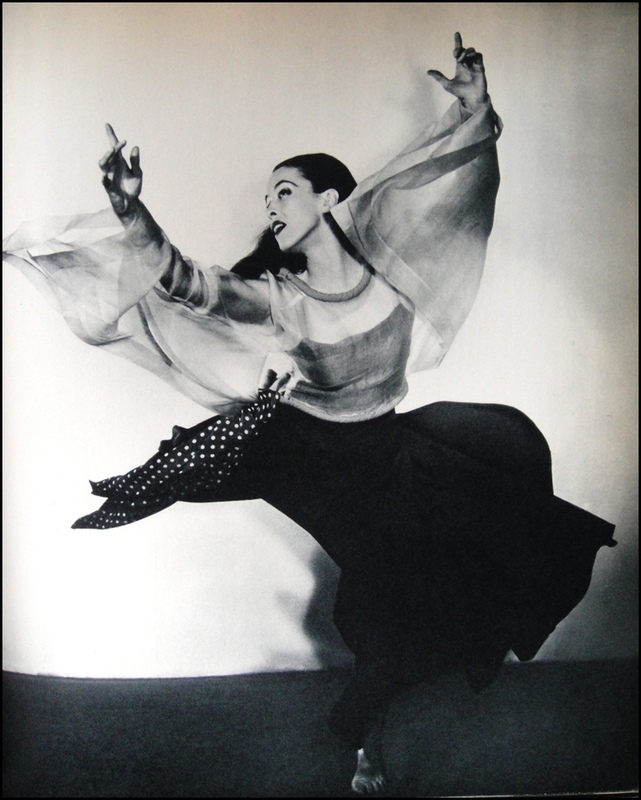 Last weekend's post contains all the details and ticket links for the Awalim workshop at AFBD and the shows produced by Jendayi in Marietta and Natakiya in the Athens area. Now we can add some breaking news about a great way to cap off a day of dance -- Aya's birthday party at Taverna Plaka! 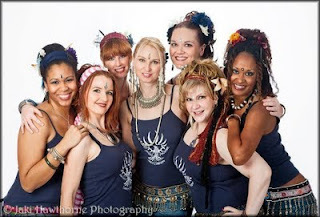 2:00 - 4:00 at Atlanta Fusion Belly Dance is the second in the Awalim Dance Company series of Foundation Revelations workshops. This one is all about using your body more efficiently for better endurance -- tips and drills that will help any dancer. Only $35 at the door or $30 in advance here! 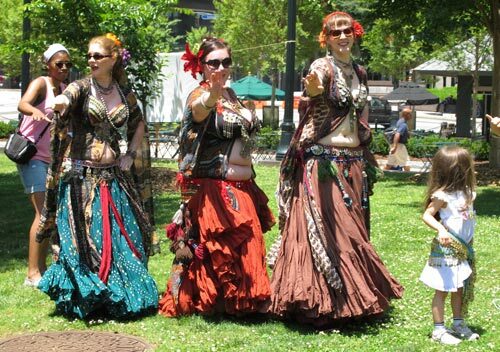 At 7:00, it's the Bellydance Troupe Appreciation show at the Art Place Mountain View in Marietta. The more I hear about this show, the more I'm looking forward to attending! I expect a great mix of performances from troupes based in Atlanta and throughout the Southeast. Also going on Saturday evening at 7:30 in Bishop, GA (near Athens) is the Kangari Tribal Dance Company student recital at the Portico. Kangari is led by my Banat Almeh troupemate Natakiya, whose generous and creative spirit flows in many directions and touches many people. And finally, around 11:00, Aya's birthday party at Taverna Plaka will bring the night to a close in true belly dance style! 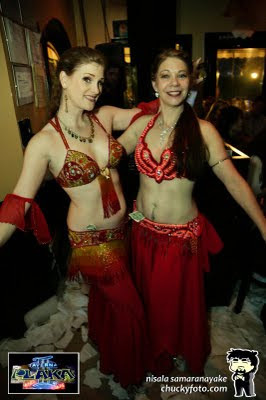 Let's hope Inara and Aziza, who will be performing at Plaka that night, stay for the party. Everyone's invited to come out to Plaka and celebrate with Aya of Istanbul! 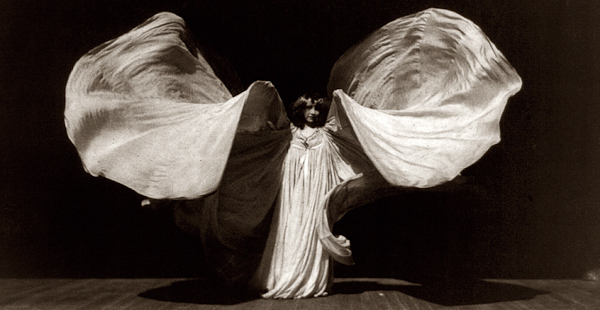 "Terpsichore Muse of the Dance"
and I no longer care if we are seen embracing. a vague sense of something to be done. 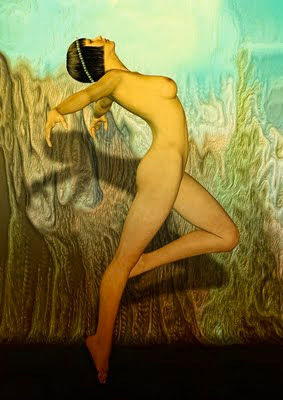 a devotee to do with what she will. guides my motions like a puppeteer. my feet skitter over the floor. When she teases, I flirt along with her. When she sings, light shines in my eyes. When she aches, I crumble to the ground. When she screams, I plead to the skies. I am a vessel of ages past. if they had no ears to hear. Have you been following the stories from Dahne of Company Mezza and Oracle of Jahara Phoenix at Examiner.com? Another great source of information about the local scene. 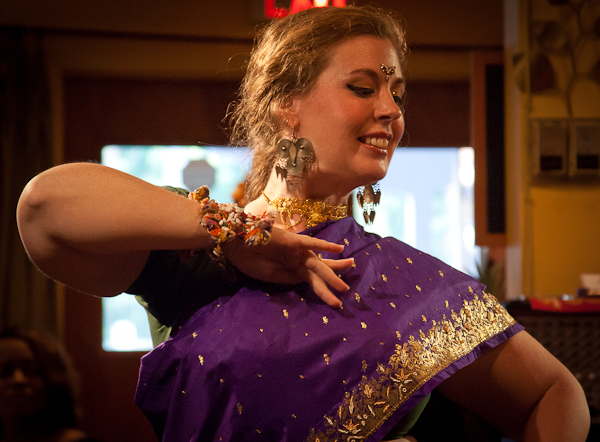 And we're mentioned in Dahne's latest post about where to study belly dance in Atlanta! I'm looking forward to her upcoming profiles of local dancers. 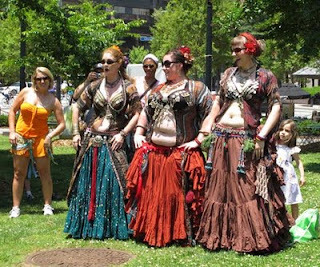 Here's a quick overview of the three big events going on next Saturday, June 25... another busy day in the world of Atlanta belly dance! At Atlanta Fusion Belly Dance, the second in the Awalim Dance Company series of Foundation Revelations workshops is going down from 2:00 to 4:00 p.m. This session is all about endurance techniques. 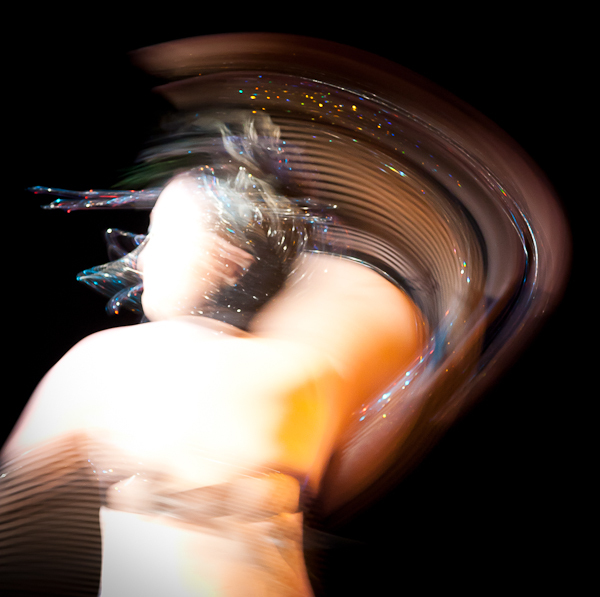 You might be surprised how building a better understanding of muscle mechanics and making small adjustments to your posture can help you maintain your energy level through long performances, weekend workshops, marathon rehearsals, and all-night haflas. Dancers of all levels will benefit from this workshop! Click here to register. 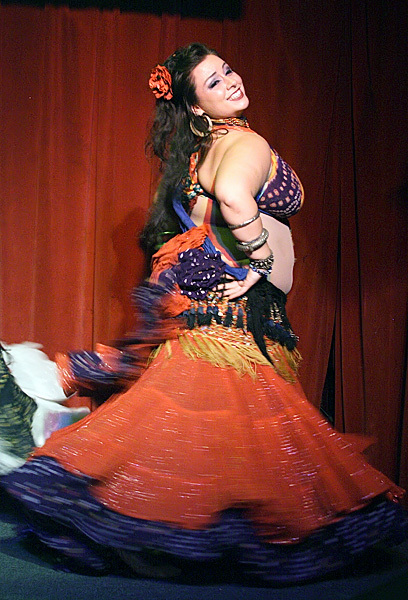 Saturday evening in Marietta, Jendayi will be your hostess for an event that's been in the works for a while -- the Bellydance Troupe Appreciation Show. You'll see performances by some of the most talented troupes from metro Atlanta and beyond, including some we don't get to see often enough! The line-up currently includes Jahara Phoenix and Sherar, Rafi'ah Dance Company from Atlanta Fusion Belly Dance, Ora Serena (led by Sarai), Emerald Hips of Chattanooga, Christy Fricks & Sulukule Dance Company from Athens, Cybelle World Fusion of Savannah, Nadia Evona Dance Company of Carrollton, the always fabulous Bahiraat, and more! Stay tuned for more news about this show -- meanwhile, get your tickets here for just $15! Finally, if you are near Athens, don't miss the Kangari Tribal Dance Company student recital at the Portico in Bishop! Led by the extremely fabulous Natakiya, Kangari is an innovative dance company that's starting to make a splash in the local belly dance scene! Doors open at 7:30 and the show starts at 8:00. Admission is free, but donations are welcome to offset the cost of renting this lovelt venue. Check out the Facebook event for more details! 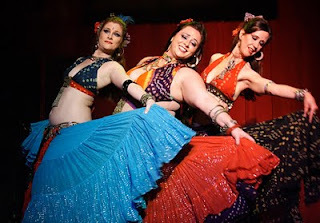 Come and see Chandani Amaya and her student troupe, Daughters of the Nile, in the beautiful setting of Imperial Fez Moroccan Restaurant this Saturday, June 18, at 6:00 (doors open at 5:30). Tickets for this show are only $20, and include a three-course Moroccan dinner, a glass of wine, and complimentary valet parking! Both pillow and table seats are available. Please contact the restaurant at 404-351-0870 for reservations. Question: Can you tell us about what he is wearing? the shawl is for skin. The cocoons make the sound of the deer walking on leaves and grass. Question: What is that he is beating on? It’s a gourd drum. The drum represents the heartbeat of the deer. 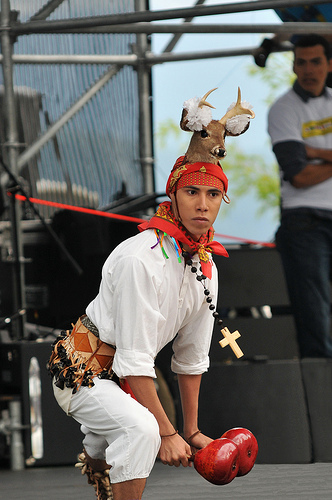 When the drum beats, it brings the deer to life. We believe the water the drum sits in is holy. It is life. It is holy. You are safe now. Question: How does the boy become a dancer? He just knows. His mother said he had dreams when he was just a little boy. You know how that happens. He just had it in him. Then he started working with older men who taught him how to dance. He has made many sacrifices for his dancing even for just a young boy. Question: What do they do with the money we throw them? Oh, they just split it among the singers and dancer. They will probably take the boy to McDonald’s for a burger and fries. The men will probably have a cold one. It’s hot today, you know. This Saturday, June 11th, there's so much going on in the Atlanta belly dance world that it's a little ridiculous! Brave the heat and come to see Awalim and Banat Almeh... plus, enjoy lots of other dance, music and fitness activities downtown! 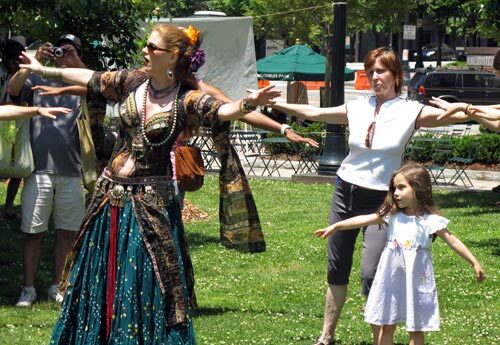 Enjoy an afternoon of dance samplers from Pera teachers and look for bargains on costumes and other belly dance gear in the market! $5 entrance fee; $10 if you want to set up a table and sell your stuff. Get more information about performing and vending here. Once again, it's time for open stage night, hosted by Kira! 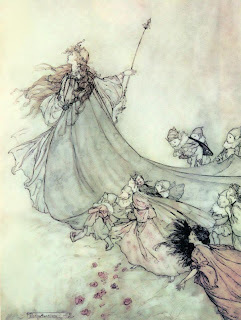 This month's theme is "A Midsummer Night's Dream." Come and sign up to perform, and dance in the drum circle starting at 10:00! Atlanta's largest belly dance studio will take over the Red Light with a cabaret show featuring student, troupe, and instructor performances. Tickets are $12 in advance, $15 at the door. Yes, this Sunday night the student show at Nicola's will have some stiff competition from our sisters in Lawrenceville (in fact, if I wasn't performing I'd probably be there)! Sherar, the student troupe of Jahara Phoenix, presents the 2nd annual "Spark of Hope" benefit show at Messina's Mediterranean Cuisine. This year's performance will be a fundraiser for Indonesian Culture Exploration, a charitable organization taking action to save the rainforests. 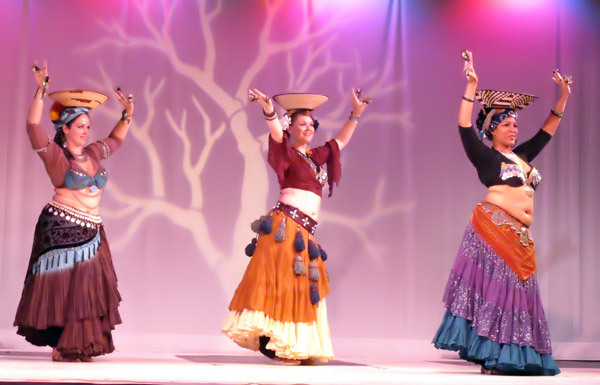 Along with the members of Sherar, performers will include Jahara Phoenix Dance Company, Jendayi Belly Dance Company, Rafi'ah Dance Company, & Oleandra. The doors will open and dinner will begin at 6:00. The show starts at 7:00. Tickets are $20 online and $25 at the door (if available). Dinner includes a chicken or vegetarian plate. Click here to purchase advance tickets. RSVP to the Facebook event here! Sunday, Sunday, Sunday! 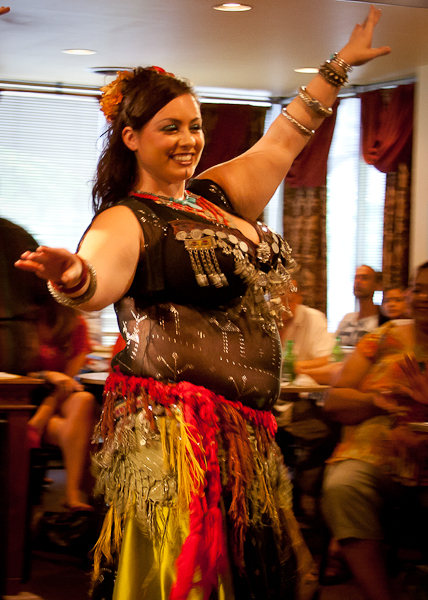 Don't miss the semi-annual Student Showcase at Nicola's Lebanese Restaurant this Sunday, June 16, featuring performances from Awalim student troupe Banat Almeh (including moi), Majda Anwar's Georgia Tech students (you might be surprised at how well those engineers and scientists can dance), and Aziza Nawal's equally fabulous students. All of these teachers are known for preparing their students very well so they can deliver professional-quality performances! 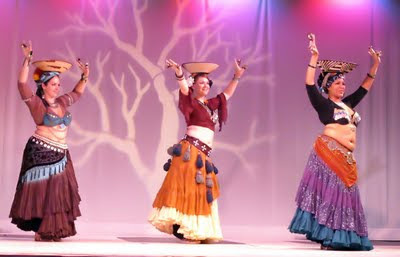 All told, you'll see a wide range of Tribal, cabaret, and fusion belly dance choreographies -- as well as student solos. Oh, and of course there will be performances by the Awalim Dance Company... making this much more than a student show! In fact, I've been going to these shows for a few years and I've seen Awalim debut some really amazing new work. So you never know what you'll see -- but rest assured that you will be entertained... Nicola will make sure of it! Doors open at 6:00 -- show starts at 7:00. Get there early and get a good seat! Get your tickets in advance right here, and RSVP to the Facebook event here for more details. This weekend will be fairly quiet... allowing the community to take a few deep breaths between Black Orchid and all the things that are going on next weekend! But there are a few performances to check out. Inara will be a very busy lady this weekend! Saturday night, she'll be wowing the crowd at Taverna Plaka with Aziza Nawal. Taverna Plaka is still one of the most fun venues in Atlanta -- great Greek food, a fun mix of music, and later in the night the napkins start flying and everyone starts dancing on the tables! Aziza will be at Plaka Friday night as well. 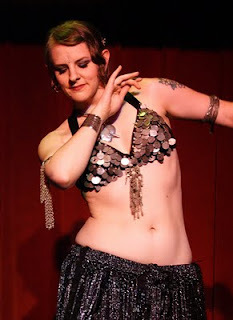 Inara is one of Atlanta's most philanthropic dancers, and on Sunday, June 5, she and her Hip Chics troupe will be performing at CAN Dance for Cancer at the Defoor Center. June 5 is National Cancer Survivors' Day, and this is a community dance event intended to unite the Atlanta dance community while raising funds for the American Cancer Society, as well as for a local family in need. Performances will begin at 4:30. Also happening this Saturday night... members of Jahara Phoenix will be performing at Messina's Mediterranean Cuisine. 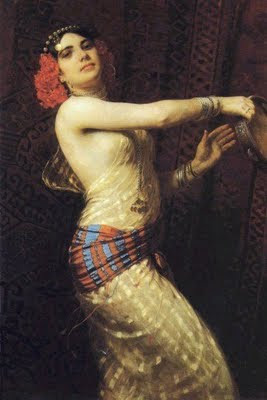 The first Saturday of every month is Bellydance Night at Messina's. Reservations are recommendation -- you can reach them at 770-935-9990. You can also RSVP to the Facebook event here. Remember to check our Calendar page for all the belly dance events happening in metro Atlanta! 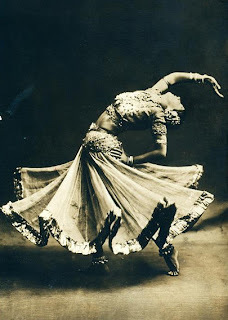 Dance when you're broken open. Dance when you've torn the bandage off.